The Commissioner of Entrance Examinations has made all arrangements to facilitate the registration of Options for allotment and admission to the Engineering/Medical/Architecture courses, Kerala for the academic year 2014-15. As the major rank lists got published, the registration process for the centralized allotment process will commence on 17th June 2014. All candidates seeking admission to the professional colleges in Kerala should have an understanding about the centralized allotment process (CAP) before the working with the KEAM 214 option registration system. It is very important to know the instructions of the KEAM 214 option registration which will help the students to enter in to the admission process without fear. The allotments to Professional Degree courses in Kerala undertaken centrally by the Commissioner for Entrance Examinations is done through a single window system (SWS) which will enable the candidates to opt for multiple courses and colleges based on a single registration. 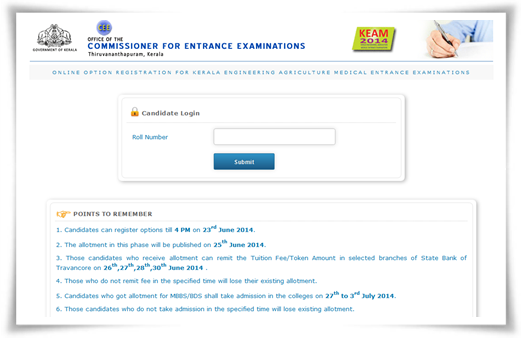 Candidates, who got included in Kerala Medical (Except MBBS/BDS)/Engineering/Architecture Entrance Examination rank lists, can register their options on the website www.cee.kerala.gov.in from 17.06.2014 to 23.06.2014, 5 pm. Candidates who do not register their options within the specific time will not be considered for allotment. As registering of Options for courses and colleges is a pre-requisite for allotments to professional degree courses, eligible candidates must have to do the process before the stipulated time. The office of the Commissioner for Entrance Examinations has set up the 'Option Facilitation Centres' (OFC) and 'Help Desks' (HD) with internet facility throughout the State during the period. This facility is introduced to provide necessary help to the candidates for registration of options by the candidates. The contact details of such centres are available on the website, http://cee.kerala.gov.in. The allotment timetable will help the students and parents to know the important dates regarding the Admission Process. The schedule for further allotments will be informed in due course. For more details about the KEAM Allotment 2014 and online registration submission process do visit the official website. KEAM 2014 engineering and architecture rank lists are expected to get published on 15th June. The rank list for admission to Engineering & Architecture courses 2014 will be published at the Office of the Commissioner for Entrance Examinations and on the website. The Engineering & Architecture Rank Lists 2014 will be prepared on the basis of submitted relevant mark submission data and attested copies of Plus Two mark sheets by the students who qualified in the entrance exam. KEAM 2014 Engineering Rank List has been declared today 15th June at http://cee.kerala.gov.in. The Engineering 2014 exam results for admission to various courses have been published at the Office of the Commissioner for Entrance Examinations and on the website. The Engineering Rank List for KEAM 2014 has been declared for those students who have qualified in exam and have submitted their Plus two marks according to the rules set by KEAM Commission. KEAM 2014 result highlights and top 10 rank holders' details are given here. The Engineering 2014 exam result for admission to various courses has been published on 15th June at the Office of the Commissioner for Entrance Examinations and on the website. As the admissions to the engineering courses will be based on the KEAM 2014 Rank lists, students can check the results online. KEAM 2014 Architecture (B.Arch) rank result has been published today 16th June. The Architecture 2014 exam rank list for admission to various courses is now available at the Office of the Commissioner for Entrance Examinations and on the website. The provisional rank list of candidates eligible for admission to Architecture course (B.Arch.) 2014 has been prepared by giving equal weightage for the marks scored in 'National Aptitude Test in Architecture' (NATA) and the marks obtained in the qualifying exam.